With all the demands of youth ministry, you are certain to encounter times when you need a meaningful devotion but don't have a lot of time to prepare. With this book you will always be ready. Inside you will find 20 devotions on topics like faith and science, cheating, heaven, drugs & alcohol, truth and media choices. Each 15-minute devotion is easy to use and rarely requires any special supplies. Whenever teenagers need to connect & reflect during a meaningful faith moment, you'll be ready. 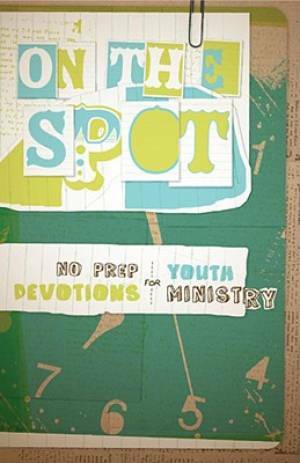 A must-have resource for every youth leader! On The Spot by Parolini, Steve was published by Group Publishing in December 2007 and is our 8680th best seller. The ISBN for On The Spot is 9780764436758. Be the first to review On The Spot! Got a question? No problem! Just click here to ask us about On The Spot.